Wi-Fi Protected Setup™ (WPS) makes it easy to add devices to your wireless network without having to enter a network name and password. Using the Linksys cloud account, connecting your wireless devices is made easier, faster and more convenient as you can just remotely access and connect your devices to your home network from a browser or mobile device. NOTE: The device you want to connect through Wi-Fi Protected Setup™ must also support WPS. Linksys Smart Wi-Fi for mobile supports Android™ and iOS phones. For browser-based access, Linksys Smart Wi-Fi is only supported by iPad®. Launch a web browser such as Internet Explorer® or Safari® and access your Linksys cloud account. To know how, click here. NOTE: If you haven’t set up a Linksys cloud account yet, click here to know how to create, activate and associate your account to the router. Click Wireless Tool on the left navigation pane under Router Settings. Toggle to the ON position. NOTE: If Wi-Fi Protected Setup™ is disabled here, the button on your router will also be disabled. • Push Button - Use this if your device has a Wi-Fi Protected Setup™ button or prompts you to press the WPS button on your router. 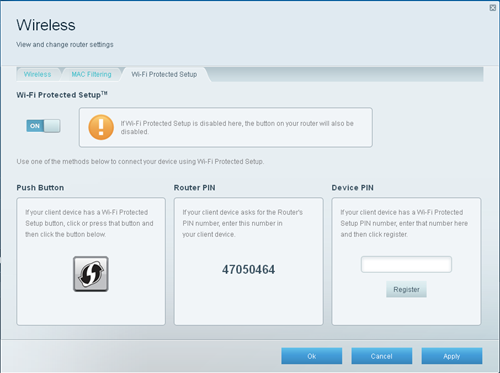 First, press the Wi-Fi Protected Setup™ button on the device you want to connect to the network and then click the WPS button on this page. • Router PIN - Use this if the device you're connecting asks for the router's Personal Identification Number (PIN). The Router PIN is also listed at the bottom of the router. • Device PIN - Use this if your device has a Wi-Fi Protected Setup™ PIN. Enter the PIN in the field provided then click Register. Your device should now be wirelessly connected using WPS. NOTE: The Wi-Fi Protected Setup™ configures one (1) device at a time. Repeat the steps for each device you want to connect. In today’s continuing technological advancements, many are into gadgets and other electronic devices. Experience the comfort of connecting wireless electronic devices to your Linksys Smart Wi-Fi Router using your Linksys cloud account. Seamlessly connecting your wireless devices to the Internet without the hassle of plugging in wired cables to your devices is fast and easy using this new service. To learn how to connect your electronic devices to your router, click here.